Custom table flags, sometimes known as custom desk flags, are ideal for conferences, meetings, trade shows or even as a decoration for your home or office desk. We can print any logo, crest, mascot, branding or custom image onto your custom table flags. Table flags come with your choice of stand, making mounting and positioning custom table flags effortless. You can view our range of stylish table flag stands on our accessories page under table flag stands. With custom table flags it is easy to add a little bit of colour to the workplace or to help increase your company’s branding at your next conference or trade show. 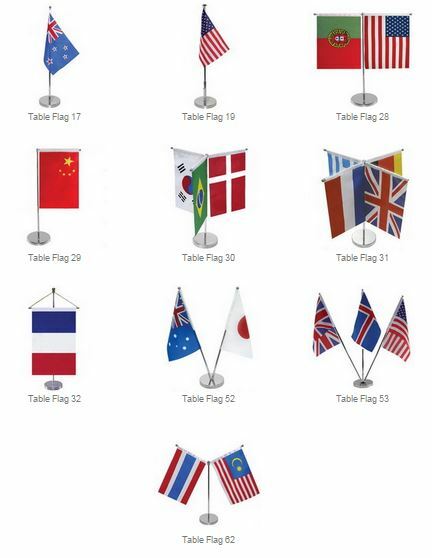 These flags are fully customizable, and are available with a wide range of pole and stand options. 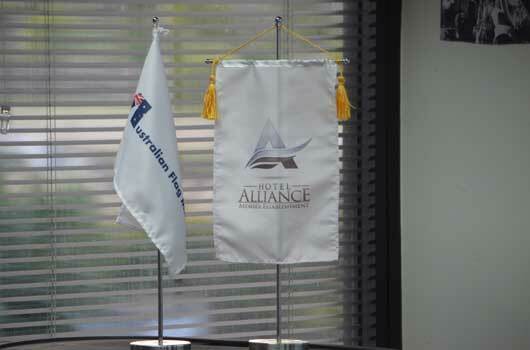 So custom table flags are suitable for all manner of businesses or personal use no matter you budget. Ask for a quote on custom table flags today. Minimum Order of 25 units. Choice of Chrome or Plastic stands.